Adding a new baby into a family can be a big adjustment. Throw in some sleep deprivation and nursing and three other crazy kids and that can be a recipe for a disaster. Eight weeks ago we welcomed a new little one into our family. We are still attempting to find our "new normal" now that she has arrived and the adrenaline burst from that exciting day has fizzled. There are several things that are keeping me sane amidst the craziness in our life right now. 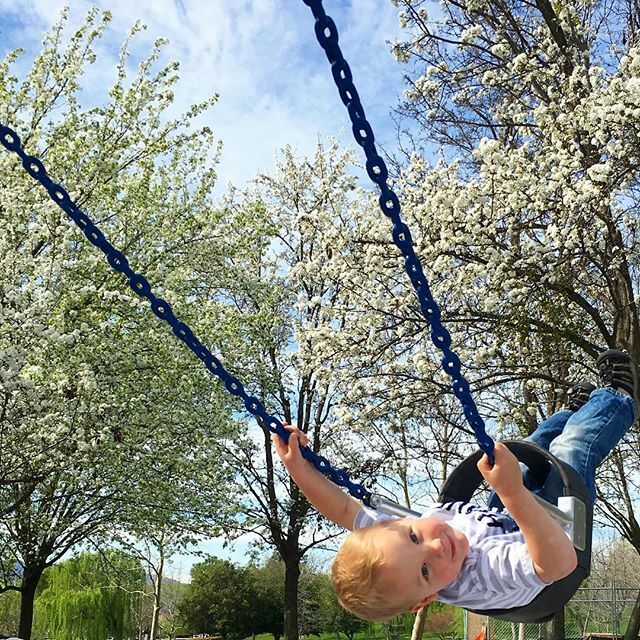 I thought I'd share what's keeping me sane with you today... and maybe you can pass along any tips that have helped you successfully find a new normal after a new baby. First off, I will admit to you that I haven't figured out how to have four kids and do laundry and do dishes yet. If you were to walk into my laundry room right now you would be appalled. You'd probably also be appalled by the sheer number of My Little Ponies on my daughter's floor too... and the fact that dishes are sitting in my sink from two days ago. I was on a roll last week for a few days and had it all pulled together... and then baseball started this week for my oldest and the baby decided she wanted to eat all day, so we're back to square one and our house and life are a disaster again. Despite the fact that my house is a disaster this week, I feel like I am thriving and making progress! Here are eight things that I've been doing over the past eight weeks that have helped me keep things semi-manageable at our house (ie. keep me sane enough that I haven't locked myself in the bathroom yet). Baby wearing is saving my life. LITERALLY. My darling newborn wants to be held all day and I love it... but I can't hold her and the three year old while also pouring milk for the five year old, etc. My friend bought my a Solly Baby wrap as a birthday gift and I am IN LOVE with it. The baby just loves being close to me and I have my two hands free to do whatever else I need to do. I cannot believe it took me until my 4th baby to figure out this whole baby wearing thing. For the first four weeks I ate a bowl of ice cream every single night and watched an episode of my favorite TV show with my husband (and the baby). Now I am streamlining the ice cream a bit (after all I don't want to look pregnant forever... since I now have an 8 week old)... but I still watch a TV show every night for a "me" break. I also usually have a treat, but not a huge bowl of ice cream every night. Knowing I get that relaxing time to do something just for me every night helps me get through any crazy day. If rained for probably the first four weeks of the baby's life or was cold... so I didn't go outside very much. It totally made me depressed! I have since remedied that and we go outside every day, even in the rain. Sunshine and/or cold fresh air is so important for my mental health! On days when I am super motivated I have been taking the baby and my 3-year-old out for a run in our jogging stroller while my two bigger kids are at school. There is no way NOT to feel happy when the view is this gorgeous. Amazon Prime is my favorite thing ever. I love that I can stock up on important things while I am sitting on the couch nursing the baby. I am planning on checking into a grocery delivery service sometime soon as well... just to try out for a month or two while we adjust to the baby's schedule. My 3-year-old has probably had the biggest adjustment to the new baby solely because now he isn't the youngest and all of my attention is now directed on someone else. He has taken the new addition to the family in stride and is IN LOVE with her, but he is also IN LOVE with me and will not leave my side. 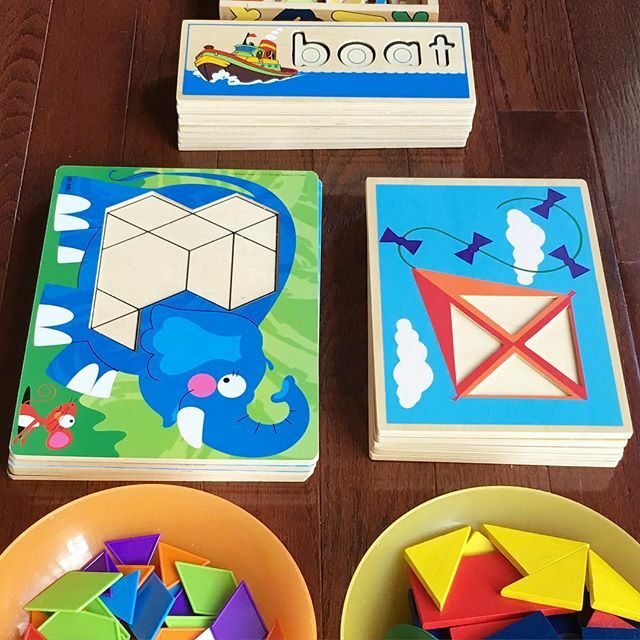 In order to connect with my 3-year-old and also get other things done at our house we have started doing simple connecting activities every day that help fill his bucket so then he can play by himself for a bit. We read stories together, do puzzles, cuddle, bake, and do science activities. 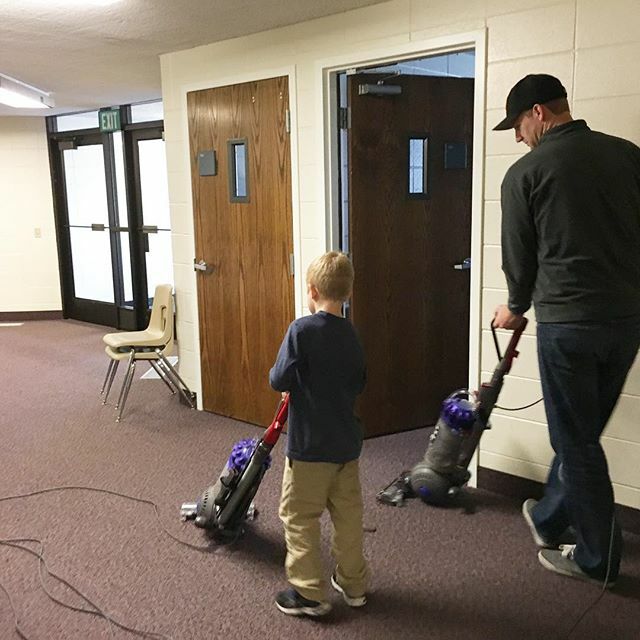 I also love to set up simple independent activities for him that he can do while I am nursing the baby or cleaning the house. I start off playing with him and then will dismiss myself for a bit to get something done and then I will come back. These connecting activities have really helped him feel less anxious about the new addition to our family. Fizzy Drip science and playdough volcanoes are our favorite science activities right now. I have a really hard time saying yes to people, but I recently decided that I need to do it more. After the baby arrived I really didn't want any meals or anything from anyone. I just wanted to get back to normal and do my thing and not rely on anyone. I quickly discovered that my body wasn't ready for that and I needed help. I was so grateful to the people from church or my neighborhood that dropped by meals or treats or gave my kids rides to school or activities. My body was able to recover and I was able to use my energy for other important things. 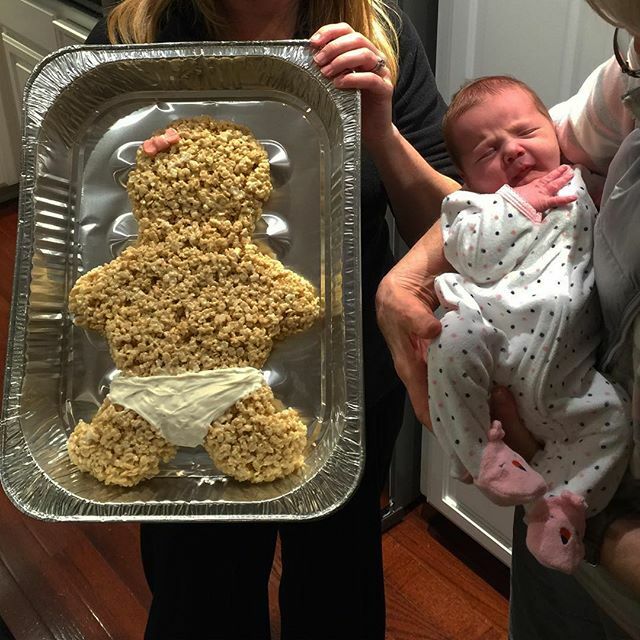 Isn't the rice crispy treat baby (below) that my friend dropped by adorable? It was inhaled in about 10 minutes or less. Saying yes to other people and letting them help can be hard for me. In order to stay sane I need to be doing things for other people. Helping other people enables me to look outside myself and not have a pity party for myself, especially when I am overtired. After the baby was born doing simple things like baking treats and taking them to friends really helped boost my spirits and helped me feel like things weren't totally out of whack. I am learning that with four kids I have to be even more organized. With a newborn and sleep deprivation I am learning that I have to write everything down and if I think about something that needs to get done I need to do it right away or set an alarm for myself so that it gets done. I have a lot of lists on my phone and reminders to get gas (since we almost ran out of gas twice in the past four weeks), turn in important paperwork, etc. I also have a lot less time during the day lately because our little baby likes to eat so often. I spend a lot of time sitting on the couch feeding her and reading books with our 3-year-old. Although I love that time we have together, I have only so much time in the day to get grocery shopping and run errands in between pick ups and drop offs of my other kids. By planning out my day really well I am slowly learning how to fit everything in and still manage to feed the baby and get some sleep. I still need to figure out how to get cleaning, laundry, and dishes into that mix... but for now at least we have food and toilet paper! Now that you've heard me ramble about how I am staying sane with a newborn and three other crazy kids... I'd love to hear how you stay sane with a newborn. I love love love the newborn stage and all of the cuddles and the opportunity to slow down a bit... but I don't love how little control I have over everything. I also know how quickly this time passes and how soon little babies turn into big kids, so I am working hard to not worry too much... and yet we can't live in a pigsty and eat imaginary food. What is hard for you in the newborn stage? 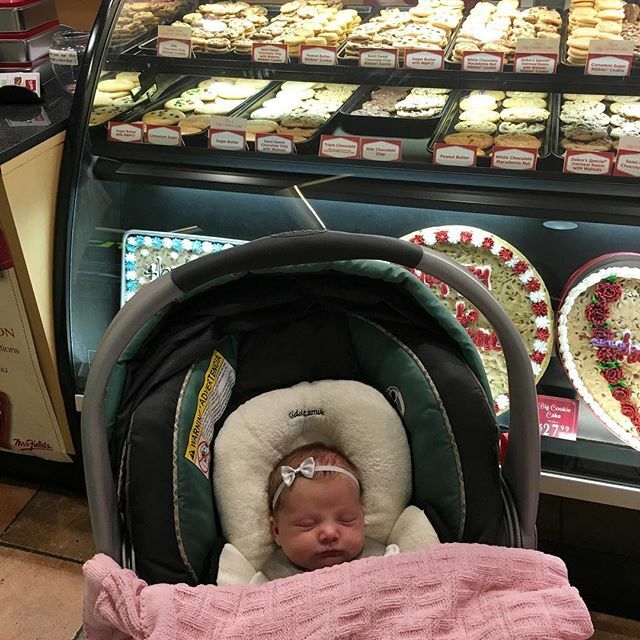 How do you manage newborn schedules (or lack thereof) with big kids and errands, etc? 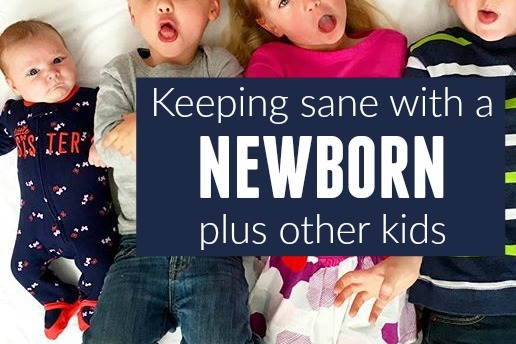 How do you stay sane with a newborn and other kids? Please pass along your tips so that I can learn from you! This is great. 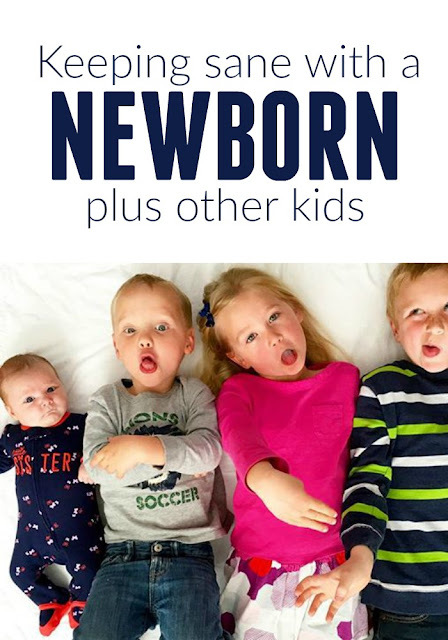 I am pregnant with my fourth and this was helpful so that I can prepare for life with 4 babies. After recently welcoming our sixth, I totally get this. For me I have to say yes to sleep... as in, sleeping until 6:30 when I'd rather get up early and accomplish something. Going to bed right after the baby early on (even by 8:30) so that I can be somewhat rested the next day and be an okay parent to the older kids who still want my attention. This is great! I just had my 2nd and am still adjusting. She is 9 weeks old now and was recently diagnosed with colic. I was diagnosed with PDD, so it's been a rough road so far, but it seems that things are on the upswing. My older child just started kindergarten and even though it was sooooo hard to "let him go", it's been a blessing in disguise because I'm able to really pay attention to & enjoy my new baby girl. Not having control has been so hard for me. I'm slowly learning to accept this new normal. I am also just figuring this out. I had my baby at the end of June (she's almost 2 months old) and my son just turned 3 at the end of July, so I've had to plan a birthday party and get used to the new baby and everything that that entails and I also just turned 40 yesterday. You could say I'm overwhelmed, but we're also taking things one day at a time. My children are ages 8, 2,1 and newborn. I loved the ideas shared here. I feel like I'm going crazy though trying to give my attention to the little ones who are so close in age.....majority of the time I feel as if I'm just meeting basic needs of my kids without getting much quality time.......the baby wrap is the best idea ever and I MUST have one.